First time I saw an Orange amp would have been when I was, kind of teaching myself to play guitar, I just remember seeing these great big, bright, beautiful things at the back of these stages. To notice the difference in sound, was kind of what first woke me up to Orange amps or at least made me first realise them. I remember the first time I really genuinely played one and found that it was compatible with the kind of tone I was trying to achieve and the sounds I was trying to make with my fingers. It was a couple of years ago, using the Rockerverb MKII, which then ended up being the amp I toured with for about a year and a half or so. 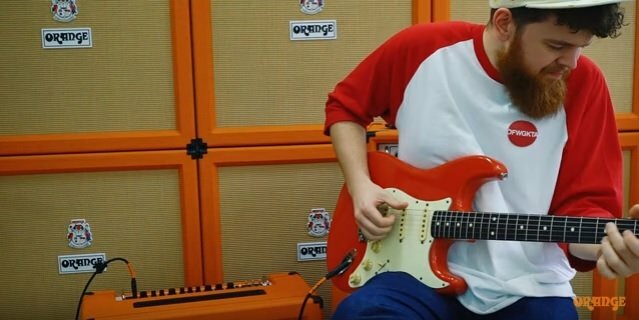 The thing I really like about Orange and the thing I really like about the Rockerverb is, it is quite restrictive, the rest of it is up to you. That is something I resonated with, there wasn’t too much fussing about. So I recently in the last six months, switched from the Rockerverb MKII up to the Rockerverb MKIII. The thing that really stepped up the amp into a whole new territory was the attenuator on it, being able to know that there is one knob on the end of the chain that will affect the volume of the amp but won’t affect the tone. Whether its festivals, whether its venues big or small, I get to turn up with this amp and know the tone is going to be the same every single time and not worry I’m going to leave people with hearing impairment. The Two-Stroke in particular has been a really fun thing to play around with, as like a post EQ thing. The one thing I have always loved about Stevie Ray Vaughan tone is it sounds like he is tearing paper. For some reason he was able to make this sound, that sounds like it just tears through the air and comes to you, but you hear every note and rips apart the world to get to you. 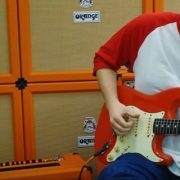 I find that Strats do that and I find that Orange, the amps do that as well and the two of them together, its the closest I’ve found to being able to achieve that tone for myself, in my kind of way. The thing I’m really interested in the Two Stroke is the clarity it brings. The minute I switched over to Orange there was noticeable difference, the kind of reaction I was getting from the crowd, the comments I was receiving afterwards about the guitar tone. Just two songs in a 1/2 hour, 40 minute set and the one thing people always remembered was the guitar. To be on a list of people of such iconic names, who also agree with that state of mind or like to play these amps is a crazy thing and I’m happy to be a part of the family. Because even though my tone and inspiration has come from Texas, I’m not. Its important that I can travel the world with an amp that respects the tone I’m trying to play and allows to make it unique if i’m ready to make it unique. It doesn’t do the work for me but gives me the tools necessary to do the best job that I can.